My quilts are made with love, made to use daily, made to last, and made with all cotton fabrics with special top stitching. All of my quilts are unique and one-of-a-kind. Designed and sewn by me with my special top stitching technique. The seams are all carefully checked and reinforced for durability and artistic creativity. They are made to last a lifetime. My personal philosophy for quilting is, "No Patterns, No Pins!" Without traditional patterns I ensure each quilt is unique and one-of-a-kind, though I do draw rough drafts of each quilt beforehand. I am not interested in perfection or absolute conformity in quilting. To achieve a bit of magic in my quilts is my true goal. I come from a family of Artists; my grandfather, my father, 2 sisters and my niece. Quilting is my personal artistic expression. I am a tactile and practical person so I like to have something I can touch and use when I've completed a piece. Quilting is a perfect fit for me. 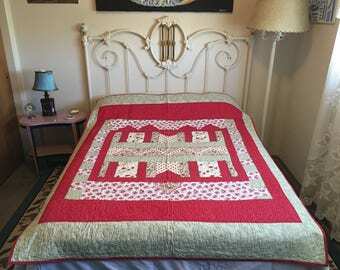 I hope that if you buy one of my one-of-a-kind, personally designed quilts that it will keep you warm and cozy and you will enjoy it every time you use it. That would make me very happy. To put a radiant smile on a child's face just by being wrapped in one of my quilts brings me great joy and satisfaction. I use high quality fabrics/threads and only all-cotton batting. I love to let the fabric dictate the design. My quilts are made in my home and not in a factory. I control the quality, design and attention to detail. Inspiration for my designs comes from many sources. A beautiful painting for example. I like to do detailed top stitching on each quilt. It adds color, style and complexity. I feel it enhances each quilt. I endeavor to transform different, beautiful fabrics into a cohesive piece of art in the form of a quilt. I began quilting about 7 years ago as an expression of my love for color, design, shape and form, but mostly for the love of fabric. I love the way fabric feels, smells, flows off the bolt, cuts and can be transformed into something altogether new, surprising and wonderful. Stacy, an Art Quilt designer and maker was born and raised in San Diego, California as the daughter of an Artist. Her home was filled with art, music, literature and love. Faith inspired me to take the next step. Her enouragment, professionalism and skills were invaluable in making LemonTwistLaMesa a reality. This business does the actual quilting for me. Stocks thousands of bolts of beautiful fabric with new fabrics arriving all the time. It is best to wash all of my quilts in cool to warm water in a gentle detergent. They can be tumble dried on regular heat.